Toyota Kirloskar Motor showcases the All New Land Cruiser Prado at the Auto Expo 2018. One of the most celebrated off-roader globally, the Prado in its renewed avatar comes with robust exteriors, impressive and highly functional interiors, while maintaining the legendary toughness and substance of the SUV. A next-generation mid-sized Land Cruiser, the All New Prado boasts of exterior updates through a new hood, radiator grille, headlamps, bumpers, fenders and a cabin that is spruced with a new design combimeter and center console is available in D-4D Diesel with engine offering a power of 127 kW @ 3400 rpm and a torque 410 Nm @ 1600-2800 rpm. 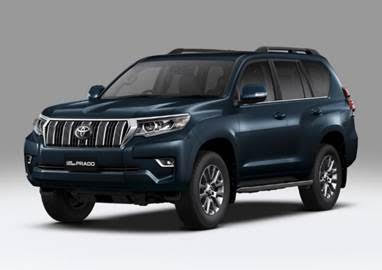 Commenting on the new offering, N Raja, Deputy Managing Director, Sales & Service, Toyota Kirloskar Motor said, “We are delighted to showcase the renewed version of our luxury SUV with go-anywhere capability – the All New Land Cruiser Prado in the Indian market. Over the years, we have continued to hone the Prado to embody an SUV of indomitable repute which has made it a head turner in any city and off-roader that will leave others trailing behind. Encompassing the enduring Land Cruiser DNA of a hard-core off-roader ready to take on any hurdles coupled with advanced robustness and functionality, the Prado’s heroic stance traces back to years of off-roading adventure and dominance on city roads. Also equipped with top-notch off-road features such as crawl control and multi-terrain select, the Prado is an offering apt for ardent adventure lovers. One of the finest of SUVs, today Prado has been esteemed in around 190 countries, by 2.95 million customers.